Why interiors? Beauty is more than skin deep, lets actually get off the street and into some Victoria buildings! Our wacky room at the Belmont Regency had a headboard and a giant armoire with wicker. Free coffee delivery in the morning, though it tasted like water. Something about that last pic makes me really realize how great the Campbell Building would be if it were still around. Were there buildings in those photos? What was you search criteria for finding those pics? "Bedford Regency", or "cute chicks bouncing on beds"? I think he was the photographer!! Nice work. Too bad they weren't wearing bikinis. actually gumgum, it was pure coincidence...really. Ah, no wonder every hotel bed I've slept in sags like a goddamn hammock. man, this little crawl space/attic type door would freak me out in my hotel room!! The photos of the Cherry Bank Hotel make me wonder if these people worked there. I like the interior hallways of the Executive House. It's got a few funky stairwells connecting the lobby with Barts. Yep, completely Faulty Towers. Zoomer, post the link to the blog story that goes along with those photos. I recall it was pretty funny. 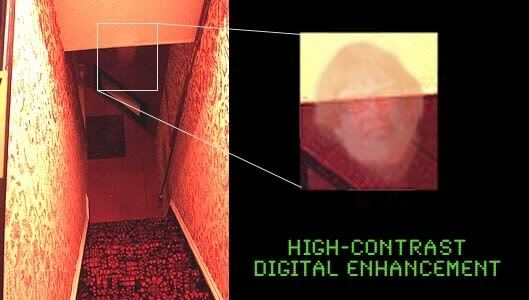 creepy there is a face at the top of the staircase in that one photo!!! Also the inside of the Old English inn is really cool. that place too is haunted. ^Dude, that's the light shade. sorry HW, I don't recall the blog story! I'm sure we could make up a good one though! No there is a face at the bottom of the top of the stairs. If you blow up the photo you can see a face. I don't know what you're talking about. I don't see anything. Edited by Holden West, 06 October 2018 - 07:42 PM. wow, that's is so eerie!!! I mean the blog story about the Cherry Bank. That ghost is just plain scary!! Reminds me of someone, I dunno who though? My sister briefly worked at the Cherry Bank when she first moved to Victoria in her late teens. She was a chambermaid, said a lot of the rooms then (mid to late 80's) were rented to prostitutes. Maybe that ghost is of a former prostitute? !